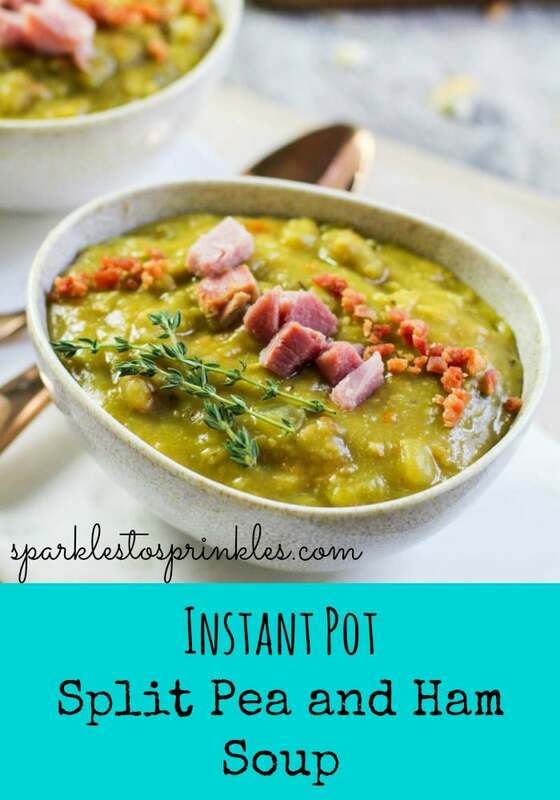 Check out my quick Instant Pot Split Pea and Ham Soup made in just 45 minutes. You get that slow-simmered taste in every bite. Hearty, savory and delicious to the last drops. The ham and bacon really add a nice flavor next to the split peas. This is even great to use leftover ham from the holidays! This Instant Pot Split Pea and Ham Soup is absolutely delicious. Recipes like this are the ones that convince me that everyone needs an instant pot. I will never forget growing up my stepfather used to make split pea and ham soup as a special treat. It was a special treat because it would take him forever to make it. It was such a labor of love but definite labor. This soup doesn’t have to be that labor of love like my stepfather did. Because of your Instant Pot, it locks in all the pressure and really gets your soup cooking super quickly, so after you do your release, all those flavors are there. You have that rich flavor as you could it for many hours. That is exactly why I call the Instant Pot a magical pot! Simply they are field peas that have been dried and split and are meant for cooking. If you didn’t know you can buy different varieties. They have yellow and green varieties. I reach for green peas for my split pea soup because they are sweeter. You would use the yellow peas for say a curry dish. Yellow split peas are milder in flavor. Unlike dried beans, you do not need to soak your split peas. I do recommend rinsing your split peas prior to cooking to get rid of any debris that was not removed in the bagging process. Split pea and ham soup are great for nutrition. You are able to pack on some dietary fiber, potassium from the peas, Vitamin K and so much more. Not to mention the protein you get from the ham in the beans. I also think if you have a child who fights eating veggies it is a great way to sneak in a few more added veggies into their diet. All the spices and seasonings really dress up the veggies to make them more appetizing. After you serve up your soup, store the rest in an air-tight container in the fridge. This soup can last for around 3-4 days. Day 2 is a great day because the flavors blend even more and you get a more flavorful soup. Yes! If you want to freeze what you won’t eat in time, and use for a later time. Put in sealable freezer bags or containers, and make sure to leave room for the soup to expand as it freezes. Then thaw and warm up and serve. The texture might be slightly off from the freezing process but the flavor will taste just as good. 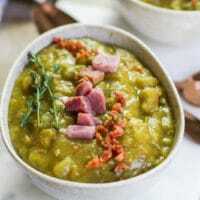 Have you ever made a homemade split pea and ham soup? 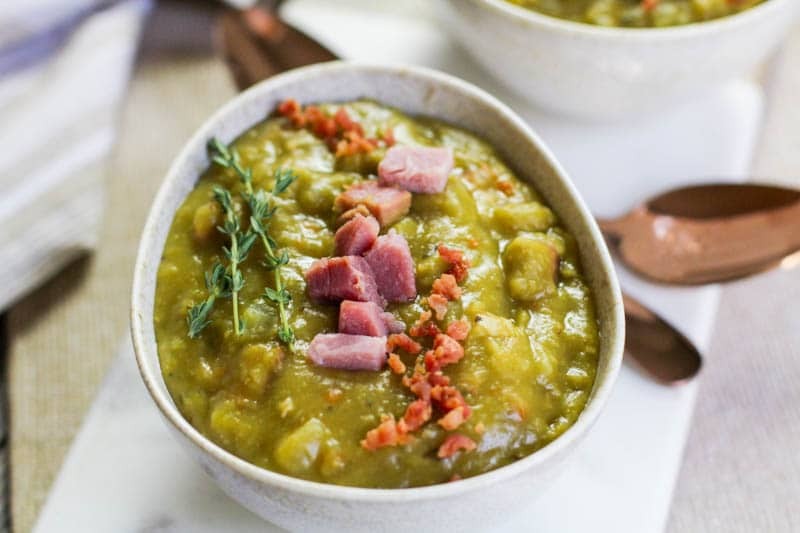 Delicious Instant Pot Split Pea and Ham Soup is the exact reason you should have an instant pot. This incredibly amazing soup is done in less than 45 minutes start to finish. In an Instant Pot, press the saute mode with a timer of 12 minutes. Heat oil and add in bacon. Cook bacon and then add in onion and cook until softened, about 3 minutes. Add in garlic, ham, oregano, thyme, and bay leaves. Cook an additional minutes. At this point the timer for the Instant Pot should be off, if not, press the cancel button. Next, add in broth and peas. Mix well to combine ingredients. Place lid on Instant Pot and set valve to sealing. On manual mode, press high pressure and set the timer to 20 minutes. Once timer is off, hit cancel and allow to naturally release for 10 minutes before switching the valve to quick release. Open lid when the pressure valve has dropped, stir gently and add in salt and pepper to taste.